The Genesis program, an initiative introduced in 2016 by the Cockrell School of Engineering’s Longhorn Engineering Advisory Delegation (LEAD), has received over $1 million in donations since launching its Hornraiser campaign on May 2. The program has invested in 16 student-led companies since its launch, involving students pursuing majors in several schools and colleges across UT Austin. The result of a year-long study conducted in 2015 by LEAD, the Cockrell School’s young alumni engineering advisory board, Genesis was created to provide critical resources that would encourage more successful startup companies for UT Austin’s vast community of student innovators and inventors. LEAD discovered that the biggest roadblock to creating startups was limited funding. In the past, student entrepreneurs had no dedicated source of pre-seed startup capital, and those interested in venture capital and startup investing had few opportunities to learn by doing. These findings inspired the group to establish Genesis, and it has since grown significantly. But the impact of Genesis goes beyond funding. The program also provides important real-world experience by placing students on both sides of the investment table, allowing them to assume leadership roles in finding deals, conducting diligence and investing in startups founded by their peers. Genesis student leaders also partner with alumni to mentor the companies they fund, guiding student founders through the challenges of entrepreneurship. A strong diversity of leaders and ideas is a top priority for Genesis, and a student from any college, year and degree level is eligible to apply for funding or a role on the investment team. Genesis portfolio companies are working on numerous projects, including renewable energy systems, advanced drone technologies, medical products and software applications and platforms. Many teams are multidisciplinary, including members from multiple colleges, schools and units on campus, and founders are able to share ideas with one another at Genesis-organized meetups or while working out of the LEA Co-Lab, a coworking space on campus, and in the Cockrell School’s National Instruments Student Project Center. Genesis plans to use the proceeds from its HornRaiser to not only fund more ventures but also enhance the greater startup ecosystem at UT. 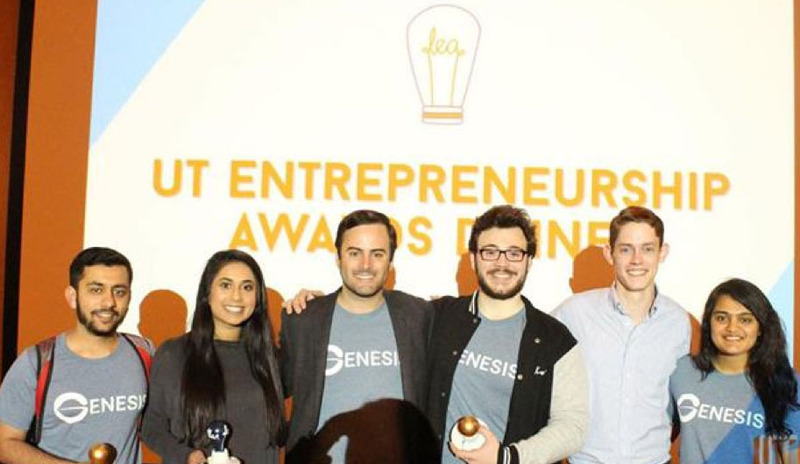 To support Genesis and UT Austin’s student entrepreneurs, visit the program HornRaiser page now.